Home Uncategories Other than that, how was your week? Other than that, how was your week? Forget for a minute that the Tigers just lost two games in a row that they were winning in the ninth. I know that's the topic on everyone's mind and I know everyone wants to talk about it, but as they say, "the definition of insanity is whipping out that quote about the definition of insanity right after a Tigers closer blows the game, are you joking, that's a good way to get mauled by angry fans." Let's talk about the fact that some other things happened this past week that were also worth noting. 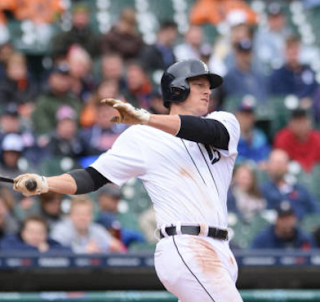 The Tigers took another series from the Indians last week, and I don't care if that comes with a giant asterisk pointing to a rain-out, it's early May of 2017 and the Tigers are not oh-for-everything against Cleveland. When JaCoby Jones took a fastball to the face a little over two weeks ago, Jim Adduci was a name recognized by his mother, his cousin, and that one weird fan in Toledo who goes to all the games and has a spiral-bound notebook with player names, stats, and hobbies written down. Adduci is not a prospect, he's a 31-year-old "lifer" who exists to fill a roster spot at Triple A, and to wait for people like JaCoby Jones to get hit in the face with a fastball. There's actually an approved script for scenarios like this. Minor Leaguer joins the club, absolutely rakes against opposing pitchers for the first game or two, and the fans cannot believe someone this good has been stuffed away in the minors for so long. Then opposing pitchers unanimously decide "hey, maybe we should start getting this guy out," they do so with stunning success, and the fans cannot believe how incompetent the front office was to sign this guy in the first place. The lesson? We are brutish animals, the lot of us, and we don't deserve good things. Anyway, Adduci is going way off script here, and it's kind of refreshing. After 12 games and 46 trips to the plate, he's batting .317 with an on-base percentage of .391 and an OPS of .903 -- or, in English, he's hitting the ball with power (four doubles and two triples already) and he's getting on base a lot. He's walking 11 percent of the time, which is above the AL average by a couple percentage points. The one red flag is that a typical AL batter gets a base hit on 28 percent of the balls he puts in play, and Adduci is currently getting hits on *43 percent* of those balls in play. You'd expect that eventually some more of those balls will get converted into outs, but on the other hand, he has a hard contact rate of 63 percent (the AL average is about half of that) so maybe he's legit. 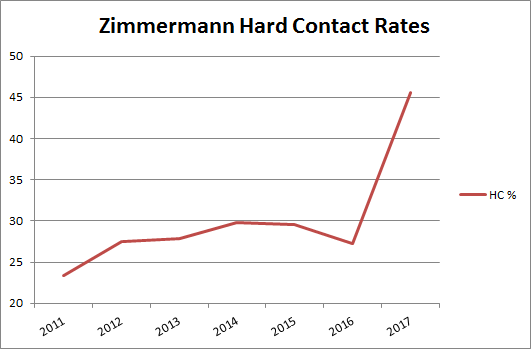 J-Zimm got a hefty contract with a sparkle-and-glitter price tag to be the Tigers' big Number Two starter. He almost immediately got surpassed by Michael Fulmer, Matt Boyd, Daniel Norris, several high school kids on a weekend bender, and an experimental pitching machine running on rocket fuel. From 2009-2015, Zimmermann threw 68 percent strikes, which is actually slightly better than the large plots of land known as Kluber, Price, & Kershaw Territory. You want a good predictor of future batter success, you look at how often he's making hard contact. You want a good predictor of future pitcher success, you look at how often he's throwing strikes. Zimmermann was one of the elite. I'm glad Fulmer and the gang are making such huge progress, but it's not ok that your bought-and-paid-for Number Two starter is actually pitching like a Number Four who's hungrily eying that Number Five spot. The Tigers' run differential is still in the negative (-5) which means that this is technically an 81-win team. I expect that number to level out as months go by, but then again, not if they don't find a way to nail down the late innings. Look at how many games have been lost late, and that -5 run differential looks 100% accurate. Related: the Tigers are averaging five runs per game, second only to the Yankees. That actually makes the run differential problem even more obvious. At least the offense looks good, and JD Martinez isn't even back yet. That's a positive, right? Let's say yes and leave it at that.